Blue grey, with subtle striations and hints of brown and cream. Our Bannack Ledge Stone veneer has a gentle color palette of blue grey, with subtle striations and hints of brown and cream, which blend well with existing materials and trim. Each stone is flecked and chipped at the edges as if hewn by hand, increasing its charm and unique qualities. This product follows the traditional ledge stone profile, ranging from 2" to 8" face heights and 3" to 18" lengths. It can be paired with complementary wainscot sills, capstones and 90-degree cut corners for a clean finish. Adding organic textures to home design is one way to connect with nature in a way that also increases the value of a home or property. Natural stone elements can be introduced seamlessly into almost any style architecture – with care to choosing the right stone profile and its placement. 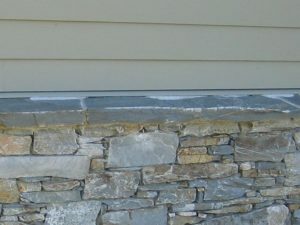 Used outside the home Bannack Ledge Stone can contribute to durable and attractive front elevations when used on eaves and half walls. It looks particularly striking used on porch or portico columns, around the front door, and for built-in seating or retaining walls around a principle entrance way. Extend the use of this material throughout the property for a sense of cohesion and harmony. Landscaping plans can incorporate Bannack Ledge Stone into patios, outdoor kitchens and fireplaces, or for retaining walls around planting beds, heritage trees or pool decks. Interior design can benefit from the strategic use of natural stone veneer products also. Bannack Ledge Stone looks great on a fireplace surround or feature wall. It can turn neglected transitional spaces such as front foyers, stairwells, landings and hallways into places to appreciate and enjoy. Used on shower or sink surrounds in a master bathroom, this material references a luxurious spa or natural grotto. Natural stone veneer products like Bannack Ledge Stone are a designer's best friend. Easy to install, neutrally toned and durable, builders, contractors and DIY homeowners also love them for adding value and organic beauty to any home or property.